Take your travel documents with you at all times. Your passports and other documents can travel with you in a money belt. Take your travel documents with you when you leave on your trip. They are worthless at home! You know you need those documents to get on the plane and get through immigrations, but don't think that once you get to your destination that you're home free. If you've made any arrangements in advance of your trip, take proof. This applies whether you are taking a tour or have made arrangements as an independent traveler. Take any paper tickets or vouchers or even copies of e-mail communications that confirm what you signed up for. You'll need some proof of purchase for catching your flights... flights for your departure from home, flights during your trip, and for your flight home. Take a confirmation number with you for electronic tickets. Those flights during your trip may be on local carriers. There are still some instances where you might be issued paper tickets if more than one carrier is involved... if so... no paper ticket, no flight. And that you should have a visa if necessary. You might have received a visa clearance from your travel agent. You will need proof of that. But we had to have the visa clearance with us to present to the immigrations officials. 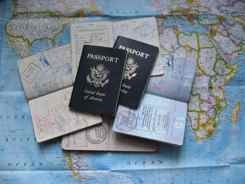 Sometimes you'll need your travel documents if you are crossing borders on your own. OK... in the European Union, you can breeze across borders and never even notice it anymore, but that's not the case in much of the world. Even going from Canada and Mexico to the U.S. you need passports these days. 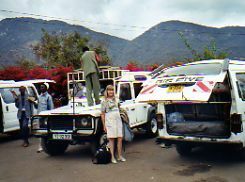 A better example is when we were on safari and went from Kenya to Tanzania by road. One safari company had set up that whole portion of the trip, but we were essentially handed off at the border. And we had to have the appropriate documents and vouchers. We encountered a similar situation when we went from Tibet to Nepal by road, only then we carried our own luggage across the border as we went through immigration. Let's just say there was no last chance visa service at that border crossing! If you've paid for entrance fees, you want proof of that. You don't want to pay twice. This might include entrances to something like special archeological zones that you fly into on your own before meeting your guide. We had to argue a bit over that when we were in Myanmar (Burma). And then take along those travel documents as proof. Whether you're on a tour or an independent traveler, ultimately, you are responsible for yourself!